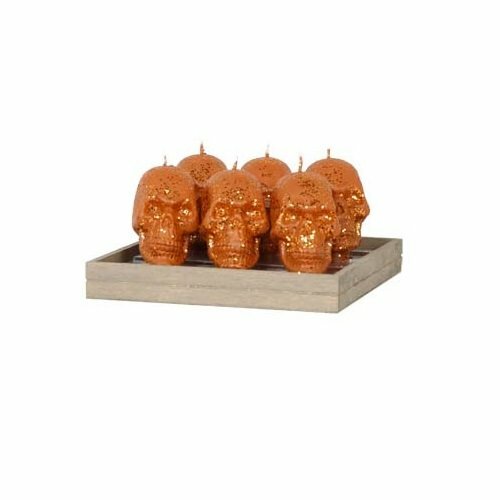 Fantastic Craft 3" Tall Copper Skull Set of Six Taper Candles. Beautifully designed and crafted with attention to detail these copper skull taper candles makes a great accessory piece to any room and will help portray the Halloween spirit for the Fall season. With its fun and whimsical design makes these truly spooky! Measures 3 Inch. Set of six pieces. Great item as a centerpiece for Halloween. Great housewarming gift for family, friends, neighbors and acquaintances. With natural colors and texture to create a 3 dimensional design come to life. If you have any questions about this product by Fantastic Craft, contact us by completing and submitting the form below. If you are looking for a specif part number, please include it with your message.